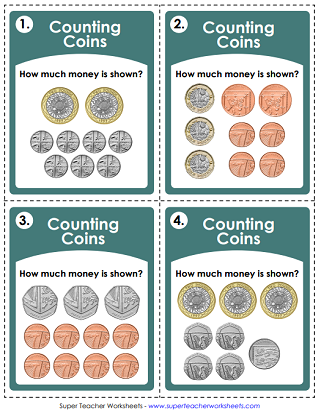 Practice counting UK money with these printable worksheets. 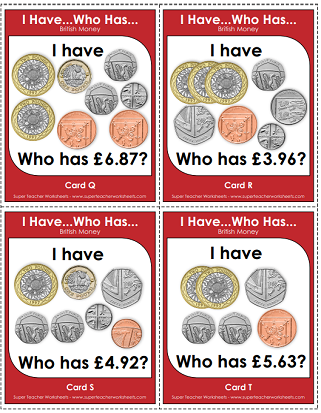 Worksheets include pictures of £2, £1, 50p, 20p, 10p, 5p, 2p, and 1p coins. The coins on this page include the following post-2008 coins: £2, £1, 50p, 20p, 10p, 5p, 2p, and 1p. Totals add up to £9.99. Keep a running record of the total money amount when you count coins. This version has modern, up-to-date coins. This file has thirty task cards with pictures of British money on them. All amounts are simple - with only 1, 2, or 3 coins. This set has task cards for intermediate-level students. There are several coins on each cards. You students can count the coins and calculate the totals. 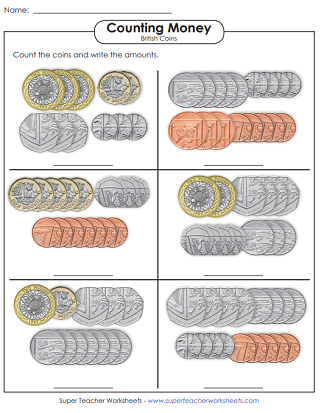 Students practice counting UK coins with this money memory match game. Play a whole-class card game in which students count British coins. Carefully count the change in each piggy bank and write the amounts in the boxes. All amounts are less than £5.00. Students count the coins in each box. The coins on this worksheet are pre-2008. Includes totals up to £6. Write a running total above each coin as you count. Includes totals up to £6. This page has blank, printable maps of the United Kingdom for your students. There's also a latitude and longitude activity. And a worksheet with British countries and capitals. Learn to count pennies, nickels, quarters, and dimes from the United States.